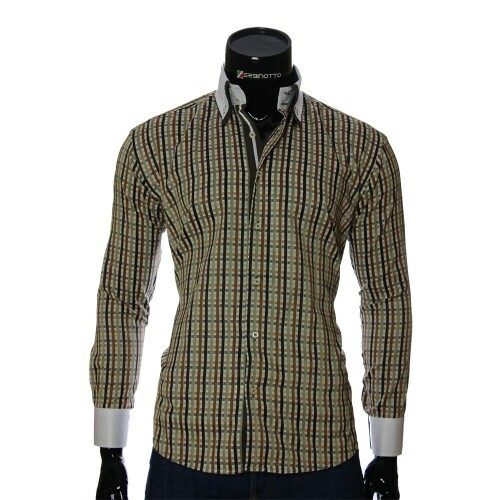 White shirt in brown and bronze plaid pattern with a double collar. A classic Walter plaid shirt from Zerbinotto™. Men's shirt is made in a classic Regular Fit cut, i.e. semi-cut A loose (classic) fit is suitable for men who prefer a free toe, i.e. 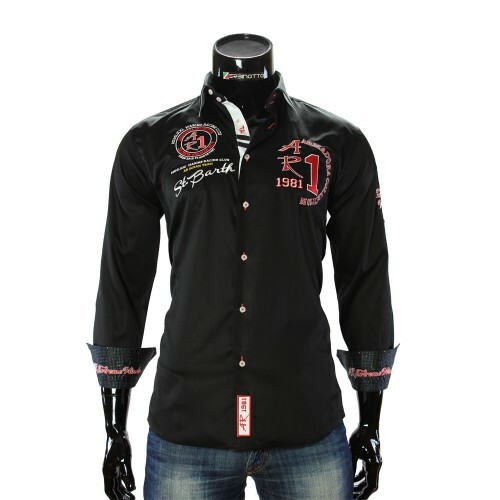 so that the shirt does not glisten, but was rather comfort. This shirt is ideal for large men, or men with a tummy. The men's shirt of the Walter collection is sewn of thick Poplin fabric. Fabric composition 80% cotton and 20% polyester. The execution of the fabric is concentrated in a small scar. After washing, the shirt softens without losing the appearance; it becomes only more beautiful - silky. 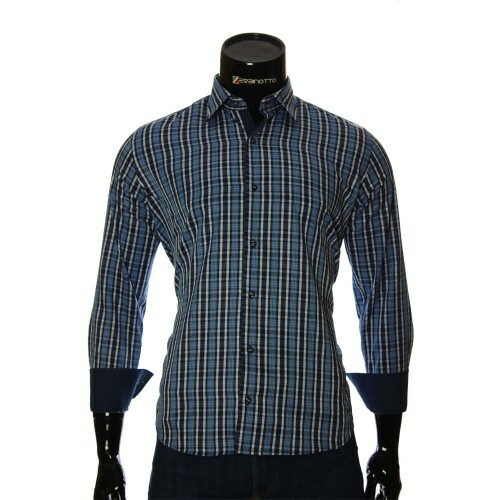 This type of fabric is very pleasant to the body. The fabric of the shirt itself has a nice sheen. Shirt color. The shirt is made in a multi-colored check with interlacing of bronze, brown, beige and black lines. At the same time, the color scheme of the base of the shirt is made in bronze tones with a golden sheen, as opposed to the button strip, the shirt collar and cuffs, which are made in dark brown and silver colors. Shirt details. Collar: Contrast shirt collar in double button-down design in French Double Collar Button Down style. As the collar of the shirt is double, the lower layer of the collar is dark brown, and the upper layer of the collar is r-white. Two layers of the collar are fastened on a white button, which is sewn with a brown thread to the shirt. The throat of the collar is fastened with two buttons, also white, arranged in a row in parallel. Cuff shirt: shirt cuffs are made in white and brown colors. Cuff style, double-sided. Thus, the outer side of the cuff is white and the inner side is dark brown. Since the shirt is universal, the shirt cuffs can be folded up, and thus, changing the color, white to brown, without draining the shirt considerably. Also sleeves and cuffs can be tucked to the elbow. Button strap shirt is made in dark brown and silver colors. Buttons are white and sewn with brown threads, thus creating the perfect color scheme. Buttons are made in square shape. 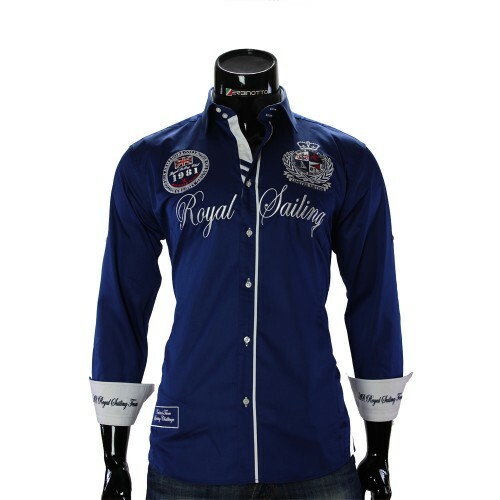 Button openings are trimmed with brown stitching. 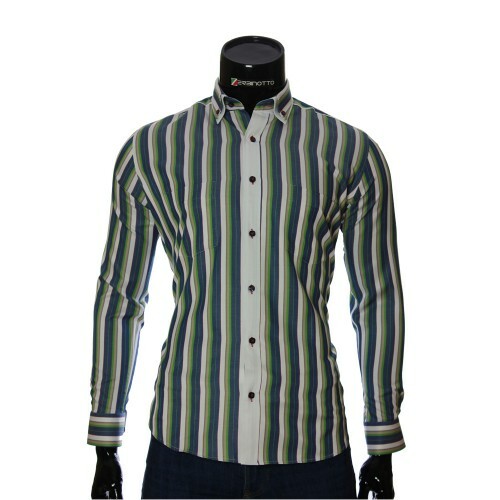 You can buy a men's Walter shirt from the Zerbinotto brand from our official website in the Regular Fit Shirts section. We also recommend you to see the parameters of the model according to the table size, which is below the product description, in order to determine your size as accurately as possible. We always have something for every lover of men's shirts, see other sections too! Men's fashion shirts - Order shirts online casual, evening and elegant. 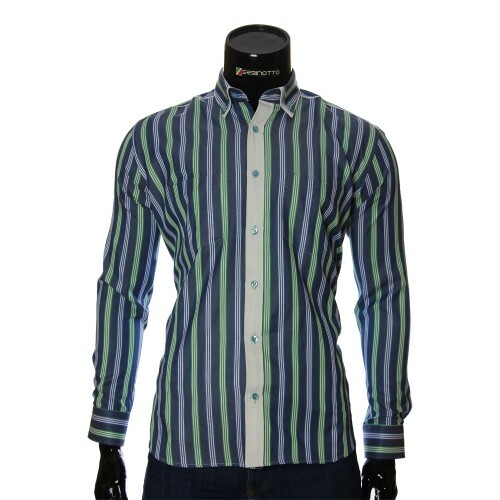 Buy in a store Zerbinotto® - the top brand among Italian shirts. купила рубашку в подарок брату и еще одну рубашку прислали для мужа, все подошло качество отличное.в общем осталась довольна. Я уже не первый раз делаю заказ в этом магазине. Очень доволен качеством рубашек. Ткань не имеет даже легкого неприятного фабричного "китайского" запаха. Для меня это знак качества. Модели и качество пошива в разы отличается от тех рубашек, которые есть на наших обычных рынках. В торговые центры я уже давно не хожу за одеждой. Там нереально завышены цены, а качество оставляет желать лучшего. Вместе с первым заказом мне вложили единоразовый купон на скидку. Очень приятно. Поэтому я поспешил им воспользоваться и заказал эту рубашку. Я мужчина довольно крупный. Именно эта рубашка этой коллекции на мне села идеально. Мне вообщн трудно что либо подобрать. В магазин пойдешь, так там только одни эмки да эльки. Ну максимум иксельки. Как я говорил ранее - качество отменное. Ткань плотная, приятная к телу, рисунок четкий, клетка везде ровная и совпадает. Цвета яркие. По размеру - согласно размерной таблице все подошло четко. Доставка Новой Почтой очень оперативная. Спасибо всему коллективу, с вами очень приятно иметь дело. Посоветовал своим товарищам этот магазин.